There is still time to have your say on plans to build 12,400 homes in Rugby Borough over the next 15 years. Rugby Borough Council has set out how it plans to accommodate the extra houses in a document called the ‘Local Plan’. Extending Rugby to the south west around Bilton and Cawston, a major development at Coton Park East, a new village on the edge of Coventry and more houses in villages have been identified as potential sites for around 8,500 homes. The Rugby Radio Site and land at Coton has already been earmarked to take the majority of the rest of the houses. 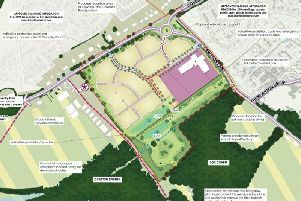 The preferred options listed have been based on two consultations that ran in the summers of 2013 and 2014, and a call for sites that was completed earlier this year. > An urban extension to the south west of Rugby with associated infrastructure, including transport, education and health care facilities. > Additional housing and employment development at Coton Park East. > Allocation of around 100 homes at each of the main rural settlements of Binley Woods, Brinklow, Long Lawford, Ryton on Dunsmore, Stretton on Dunsmore, Wolston, and Wolvey, subject to suitable sites being available. > A new village south of Walsgrave Hill Farm, to the east of the A46 opposite the University Hospital of Coventry and Warwickshire. > Removing two small sites from the green belt, at Long Lawford and at the M6 junction 2, on the basis that they no longer meet the requirement for being classified as green belt. The total number of houses that Rugby Borough Council has been told to find has increased by 2,8000 as, like other Warwickshire councils, it has to take on an unmet shortfall from Coventry. Hard copies of consultation documents are also be available at the Town Hall and local libraries. Responses to this consultation must be received by the Development Strategy team by Friday February 19.